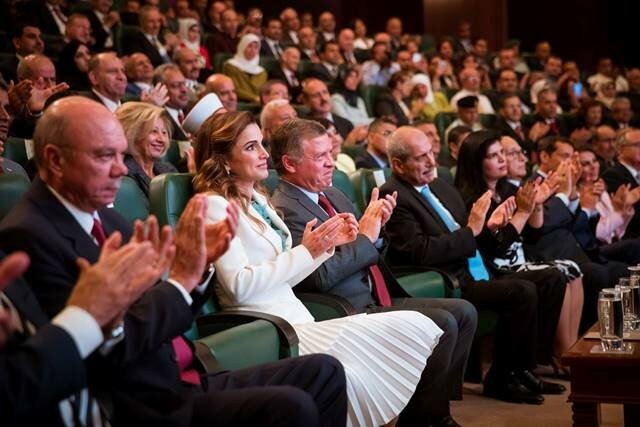 (Jordan Times, Amman) - Their Majesties King Abdullah and Queen Rania on Monday attended the launch of the National Strategy for Human Resources Development, a Royal Court statement said. During the ceremony, the National Committee for Human Resources Development (NCHRD) presented its recommendations to develop the education sector in the Kingdom and human resources in general. The committee was formed in April last year after His Majesty King Abdullah sent a letter to then prime minister, Abdullah Ensour, highlighting the urgent need for Jordan to develop an integrated, comprehensive, strategic and well-defined system for human resources development. In the letter, the King said the committee should prepare a national strategy, from which a 10-year plan could be drawn to develop several sectors. The plan deals with developing elementary education, higher education, technical education and vocational training sectors with the purpose of achieving a qualitative leap in human resources. The committee’s mandate is compatible with the expected outcomes of the economic vision 2015-2025 and the executive national strategy for employment. The launch, held at the King Hussein Business Park and attended by several members of the Royal family and Prime Minister Hani Mulki, is seen as the beginning of a comprehensive development of human resources according to executable programmes and plans and clear measuring units, which are to be approved yet by the Cabinet. During the launch ceremony, Her Majesty highlighted loopholes and shortcomings in the existing educational system, and called for revolutionising the education process in the coming decade. “Education reform is not easy, and it demands an unprecedented effort in order to achieve unprecedented results. We must rethink structural issues such as education management and introduce policies that bring highly qualified teachers into the teaching profession, and maintain their level of competence. Of equal importance are issues such as accountability and taking responsibility for poor educational outcomes,” Her Majesty said. For his part, head of the committee and Higher Education Minister Wajih Owais voiced the committee’s appreciation for Their Majesties support and showcased the steps the committee took in order to approve an action plan and the makeup of the strategy. He said that the NCHRD cooperated with several experts in different fields, with whom it discussed various studies and recommendations after setting up 17 sub-committees that comprised academics, journalists and economists. The recommendations the committee reached include an interconnected set of reform-related solutions to be implemented according to a priority scale and a set timeframe, as far as available funding options and economic conditions allow, Owais said. At the conclusion of the ceremony, Owais presented Mulki with the final document of the national strategy to develop human resources. A follow-up and oversight mechanism will be worked out to ensure that the plan is implemented according to the book, the statement said, adding that the recommendations of the NCHRD included establishing a roadmap towards a better system to improve human resources within three levels; the short-term changes, implementation of new initiatives and spreading reform on the entire education system levels. “Very proud and impressed with the National Strategy for Human Resources Development launched today. With the committee’s clear plan in place, it is time to roll up our sleeves and work hard for a brighter future,” His Majesty said in a post on the Royal Hashemite Court official Facebook page.